Researchers at the Large Hadron Collider have declared the finding of a new particle called the pentaquark. 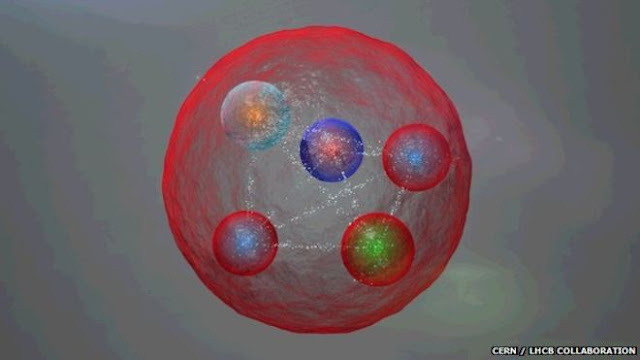 It was first anticipated to exist in the 1960s but, much like the Higgs boson particle before it, the pentaquark evaded science for decades until its discovery at the LHC. The finding, which amounts to a new form of matter, was made by the Hadron Collider's LHCb experiment. The results have been submitted to the journal Physical Review Letters. In 1964, two physicists - Murray Gell Mann and George Zweig - self-reliantly suggested the presence of the subatomic particles known as quarks. They theorized that key properties of the particles known as baryons and mesons were best described if they were in turn made up of other essential particles. Zweig created the term "aces" for the three new hypothesized building blocks, but it was Gell-Mann's name "quark" that caught the attention. This model also acceptable for other quark states, such as the pentaquark. This only theoretical particle was composed of four quarks and an antiquark (the anti-matter correspondent of a normal quark). Through the mid-2000s, numerous groups claimed to have discovered pentaquarks, but their discoveries were consequently undermined by other experiments. Patrick Koppenburg, physics co-ordinator for LHCb at Cern, told BBC News "There is quite a history with pentaquarks, which is also why we were very careful in putting this paper forward. It's just the word 'pentaquark' which seems to be cursed somehow because there have been many discoveries that were then superseded by new results that showed that previous ones were actually fluctuations and not real signals." You can read more about this discovery here.